Press Freedom blow in Egypt as Al Jazeera journalists jailed. Monday June 23, 2014 - Press Freedom in Egypt receives a blow as three Al Jazeera journalists given a total of twenty four years. Greste and Fahmy were sentenced to seven years in jail, while Baher Mohamed was sentenced to an additional three years for possession of ammunition. Mohamed was in possession of a spent bullet he had found on the ground during a protest. "Two Al Jazeera English journalists have been sentenced to seven years in jail and one to 10 years by an Egyptian court on charges including aiding the Muslim Brotherhood and reporting false news. Greste, Fahmy and Mohamed were arrested in December in Cairo as they covered the aftermath of the army's removal of Mohamed Morsi from the presidency in July. 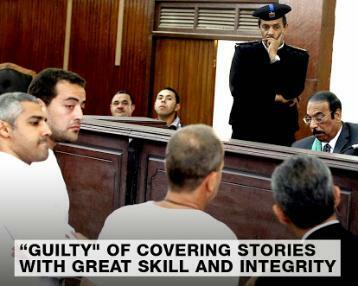 The guilty verdicts were delivered by a judge on Monday against Peter Greste, Mohamed Fahmy and Baher Mohamed. Greste and Fahmy were sentenced to seven years in jail, while Baher Mohamed was sentenced to an additional three years for possession of ammunition. Mohamed was in possession of a spent bullet he had found on the ground during a protest. Other Al Jazeera journalists being tried in absentia were sentenced to 10 years. Their names are: Alaa Bayoumi, Anas Abdel-Wahab Khalawi Hasan, Khaleel Aly Khaleel Bahnasy, Mohamed Fawzi, Dominic Kane and Sue Turton. Al Jazeera has always rejected the charges against its journalists and maintains their innocence. The prosecution said Greste, Al Jazeera's east Africa correspondent, and his Egypt bureau colleagues aided the Brotherhood and produced false news reports of the situation in Egypt. The Brotherhood, which supported Morsi, was listed as a "terrorist" organisation by the interim Egyptian government shortly before the accused were arrested. Australian Peter Greste is a brave, very brave journalist, who like his colleagues are committed to reporting objectively on events on their patch, not blinking an eyelid when confronted by threats that they report favourably on behalf of any group or person. His country's Foreign Minister Julie Bishop has already given a press briefing in which she said that there were many options to be considered in obtaining freedom for Peter. This could include an appeal, getting communication lines open directly to Egyptian President Sisi as well as comforting the relations of the man. The BBC, for whom Peter Greste had reported before stated - "The trial has caused an international outcry amid claims it is politicised. 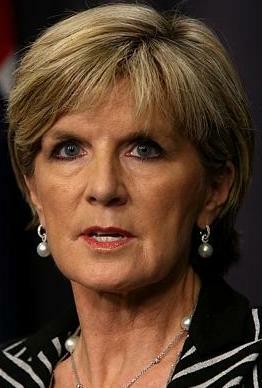 Australian Foreign Minister Julie Bishop told reporters on Monday she was "bitterly disappointed" by the outcome. "I simply cannot understand how a court could come to this conclusion," she said. Correspondents say evidence put forward earlier in court did nothing to support the serious charges brought. "In an interview on Al Jazeera shortly after the verdicts were read, Amnesty International director Steve Crawshaw deplored what he called an "outrageous ruling" and called it an "absolute affront to justice." Mostefa Souag, the acting director general of Al Jazeera, called the verdict "shocking" in a televised interview. "I don't think it has anything to do with justice," he said, calling it another step in Egypt's "campaign of terrorizing people and terrorizing the media." Al Jazeera English managing director Al Anstey said in a statement that the sentencing "defies logic, sense, and any semblance of justice." "There is only one sensible outcome now," Anstey added. "For the verdict to be overturned, and justice to be recognized by Egypt. We must keep our voice loud to call for an end to their detention. Mohamed Lotfy, executive director of the Egyptian Commission for Rights and Freedoms who has observed every session of the trial for Amnesty, said the verdict sent a chilling message to all opposition figures in Egypt. "It's a warning to all journalists that they could one day face a similar trial and conviction simply for carrying out their official duties," Lotfy said. "This feeds into a wider picture of a politicised judiciary and the use of trials to crack down on all opposition voices." David Cameron is "completely appalled" by the jail sentences handed down to three Al Jazeera journalists in Egypt, Downing Street has said. Responding to the verdicts, a Number 10 spokesperson said: "The Prime Minister is completely appalled by the guilty verdicts". She said the UK would "continue to raise this case with the Egyptian Government," and added that Mr Cameron was "particularly concerned" at reports of procedural issues with the trial. UK Foreign Secretary William Hague has not only called for a review of the "appalling sentences" urging Egypt takes another look at the entire fiasco but that the Egyptian Ambassador to the Court of St James would be invited to the Foreign Office. "The conviction today of three Al Jazeera English journalists accused of “falsifying news” and belonging to or assisting the banned Muslim Brotherhood movement in Egypt is a ferocious attack on media freedom, said Amnesty International. “This is a devastating verdict for the men and their families, and a dark day for media freedom in Egypt, when journalists are being locked up and branded criminals or ‘terrorists’ simply for doing their job,” said Philip Luther, Director of the Middle East and North Africa at Amnesty International. An Amnesty International trial observer recorded several irregularities and examples of complete ineptitude during the proceedings. In 12 court sessions, the prosecution failed to produce a single shred of solid evidence linking the journalists to a terrorism organization or proving they had “falsified” news footage. “The trial was a complete sham. Consigning these men to years in prison after such a farcical spectacle is a travesty of justice,” said Philip Luther. We await reactions from the government of the rat in Freetown as one of its "enemies of the state" journalists are given these prison terms after a show trial that was as unfair as it was politically-motivated and vindictive. Remember the muck thrown at respected international journalist Sorious Samura after he exposed the illegal logging going on under the nose of the rat? He was described as an enemy of the state. Well we need not remind our great readers as to why the Chief of Staff, one Richard Konteh was sacked. He was sacked for alleged corruption over mining and timber deals. Please read this statement from the government in reaction to the Al Jazeera documentary by Sorious Samura.